The Kaba is a cubical structure about 60 feet high and 60 feet wide. It is surrounded now by Al-Masjid Al-Haram, the Sacred Mosque, the largest mosque in the world. Near the Kaba is the Well of Zamzam and the hills of Al-Safa and Al-Marwa. Both the well and the hills are significant because they are part of the story of Hagar’s search for water for her son Ishmael. The Black Stone is located on the southeast corner of the Kaba. The stone is believed to have been given to Adam. Pilgrims try to kiss the stone during the hajj. The inside of the Kaba is empty. The outside is covered by the kiswah, a black silk cloth embroidered in gold with verses from the Qur’an, which is replaced annually. From the time of Abraham and before the rise of Islam, pilgrims from all over the Arabian Peninsula would come and visit the Kaba. Over time, the Kaba housed around 360 idols. 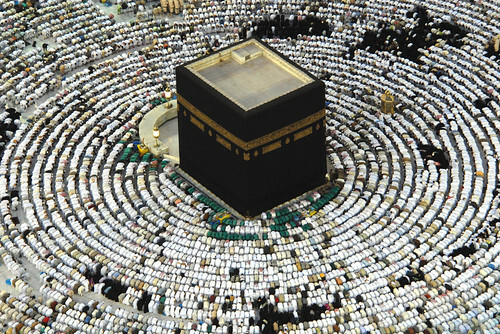 After the Prophet Muhammad recaptured Mecca in 630 C.E., he rededicated the Kaba to the worship of one god, Allah. Scholars estimate that the Kaba has been reconstructed between 5-12 times because of damage done to the structure through warfare and natural disasters, like flooding; however, each time, it was rebuilt on the foundations set by Abraham and Ishmael. The Kaba is also known as Al-Bayt Al-Ateeq (the ancient house) and Al-Bayt Al-Haram (the honorable house). Muslims do not worship the Kaba itself. Rather, it acts as an important unifying point for believers around the world. It is in Mecca at the Kaba that Muslims feel the connection of heaven and earth. It is for this reason that the Kaba is considered to be the holiest site in Islam. Have you visited the Kaba? What was your experience at the sanctuary? Why do you think that the Kaba is important? Are there sites in other faith traditions that have the same function as the Kaba? Please share your comments below. This entry was posted in Beliefs and Practices, The Hajj and tagged #SSRCWCG, Abraham, hajj, Ishmael, Kaba, Mecca, Prayer, Safa and Marwa, Zamzam by Reem. Bookmark the permalink. I remember when I saw the Kaaba the first time. I was apprehensive because I had been told by many people that it would be a very moving experience. I had arrived with a group of mostly revert muslims from Canada just prior to fajr and we went to the masjid and prayed on the second or third level. After the salat, we gathered near one of the archways that look down onto the kaaba and our group leader reminded us about the traditions muslims observe when seeing the holy house for the first time. I kept my eyes on the floor as I moved close to the archway trying to think of something really significant to ask for in prayer because one tradition is that the believer will be granted his prayer that he/she makes on first seeing the kaaba. My mind was flooded with ideas and desires and I was swept up with a sudden urge to see the black cube which overwhelmed my desire to have a particular prayer answered, so, I looked up and…nothing! for four or five seconds I stood there gawking with nothing happening. I thought about what I expected and compared it to reality and tried to sort out what was happening and then it hit me. Allah had invited me to his house! Here I was, a third of the way around the world only a little more than 3 years after accepting Islam gazing on the most holy site (sight) in the world. Tears began flowing from my eyes and I was awash with more emotion, some of which conflicted with others, than I have ever felt in my whole life (and I’m not really a young man). I think I felt every positive emotion a person can feel, and all at once. it was electrifying! That was almost 2 years ago and I am still processing and benefiting from that visit. I would urge any muslim who has never made the journey to do all they can to go, and I would urge any muslim with means to sponsor someone to make the trip. When I think of the rewards, I can feel those emotions wash over me all over again.